Description: This course provides a general overview of federal income tax laws for individuals. It explains who must file, which tax forms to use, when the return is due, and other general information. 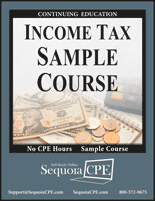 This sample course is provided only to show the format and structure of Sequoia CPE courses and cannot be taken for credit. Note: Content provided in the sample course may not be up-to-date. If you would like, you can download the course material and take the short 5 question sample exam to familiarize yourself with how our courses are presented before purchasing your membership.